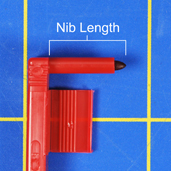 In addition to the chart recorder pens ribbon cartridges shown below we carry the complete Honeywell line of paper for Honeywell chart recorders. All the recorder pens are also available from us along with other recorder parts such as sensors and recorder drive motors. Items not shown are available off line through our SPECIAL ORDER DEPARTMENT.